Achieving a 2018 Certificate of Excellence from Trip advisor I would like to welcome you to Cosy Corner Cottage in the picturesque village of Baslow in the heart of the Peak District and a short distance from the famous Chatsworth House and Gardens. 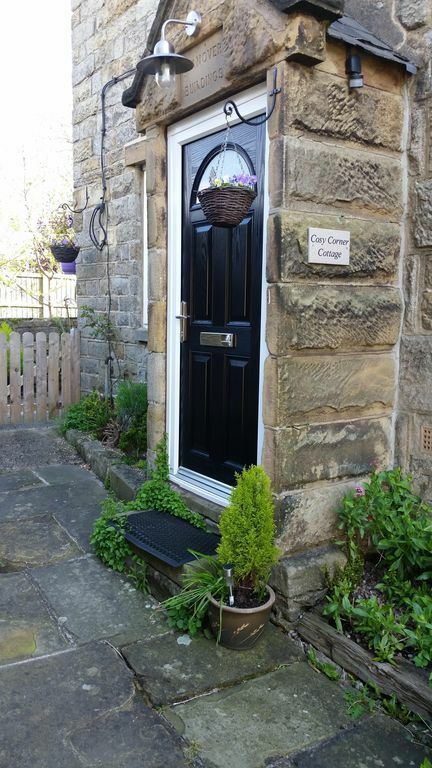 Cosy Corner Cottage is a one bedroom retreat and is hidden in a quiet corner of Baslow away from the road and set beneath its gritstone edge offering an opportunity for walking, rock climbing, cycling,sightseeing or just relaxing. There is unrestricted on road parking however there is no need to drive anywhere with so many attractions literally within walking distance of Cosy Corner Cotttage . Making an evening or daytime stroll to Historic Chatsworth, Froggats Edge or the beautiful town of Bakewell an added photographic opportunity. Baslow is spoilt by a choice of fine pubs and bars and only a short walk away from Cosy Corner offering hand crafted beer by a local brewery to award winning Michelin star restaurants serving fresh, seasonal food using local ingredients. It really is on your doorstop at Cosy Corner. Proud to have won a 5*certificate of excellence award. All comments can be viewed on line through Trip Advisor. "The cottage is beautifully presented and perfectly formed with everything you could need for a long of short stay. Tucked away from the road, the cottage is quiet and comfortable and perfectly situated for all manner of walks and it certainly made a perfect base for us as we spent 4 days exploring the Peak District "
If you enjoy walking ,exploring, bike riding or even caving .Cosy Corner has everything on it's doorstep within a stroll of Chatsworth Estate. Or Do you prefer to relax, read and enjoy good food ? Only a few minutes walk away are a choice of Bistro, Michelin star restaurant and pubs. The choice is yours and with a quiet cottage to come back to a lovely peaceful morning in bed is always an option ! Cosy Corner is part of an old chapel. It is small and spacious and very quiet. Outside through a gate Cosy Corner has a seating area for your afternoon tea. Walking is literally on the doorstep to Chatsworth Estate or The Edges. A car is not necessary if you prefer to relax locally. Trip advisor reviews on are line to see for yourself what my guests say. My priority is for you to enjoy a wonderful stay in the cottage that I love and hope you do too. A white microwave is on a shelf. A range of all dishes and utensils ate available including microwaveable. Lovely clean cozy compact cottage. It was worth its 5* rating. My husband I had a two night stay at this lovely cottage to celebrate our first wedding anniversary and we couldn't have picked a better place! The location was perfect for exploring/walks and the cottage itself was really well equipped with loads of little extras that made the whole experience lovely. Would definitely recommend and stay again. Liz made us feel very welcome - thanks Liz! Ahhh what a lovely review!! !🙂🙂I am so pleased you enjoyed your stay especially for such a special occasion . Amazaing place. Tucked away from the road but still with ample parking. Some lovely pubs very close can be reached within a 10-15 minute walk. Also a lovely walk to Chatsworth house. Could not fault the cottage at all fantastic information on what is on offer in the surrounding areas and a great location. Liz even returned some items that we had forgotten to pick up. All in all a great place. Highly Recommended. We had a lovely 2 day break here whilst walking in the peak district. The cottage is ideally located with a range of walks available from the doorstep, a number of pubs and restaurants within walking distance and the spectacular Chatsworth house close by. The cottage itself is beautifully decorated with a modern design and was immaculate. It makes for a very comfortable stay and the owner provided a wealth of information on things to do in the area along with the lovely added touches of tea, coffee, hot chocolate, biscuits and milk. The cottage has everything you will need and the owner went above and beyond in preparing us for a comfortable stay. Would recommend to all looking for a getaway in the peak district. Good spec property with everything you need. Perfect for a quiet break away from the kids! I am pleased you enjoyed your stay!